Sara Richard's Blog: Signed up for Toronto's FAN EXPO! Signed up for Toronto's FAN EXPO! Working on maybe getting to a few more shows this year. Sorry for the sparse updates, I've been working hard on catching up on commissions, sketch cards and illustrating a children's book! Hopefully i can announce the details on that later this month. 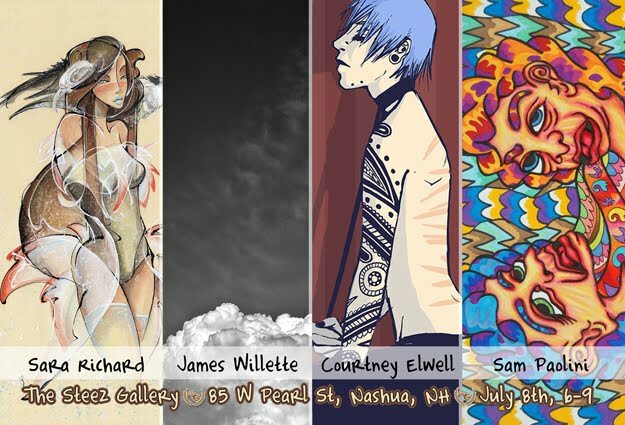 Today, if you're in the Nashua NH area, come check out the opening at the Steez Gallery on w. Pearl st. Flier is belooooowwww: (if not today, the show will be up all month) I have originals and prints up on the wall for sale!